Shift: It was made of linen cloth. Served as nightshirt, undershirt and underwear. Boys and girls usually owned 3-5 of them and didnt wear a clean one every day. Stockings: Worn on he legs and held on, under, or above the knee. Served a purpose that was alot like socks would today. 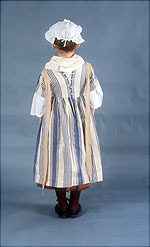 Usually hand-knitted of wool or linen cloth. Jumps: This is a lot like a stay. This piece of clothing is for supporting good posture. It is backed with whalebone, wood, or reed. It wasnt as stiff as a stay. Both boys and girls wore them for good posture because at that age developing good posture was crucial. Petticoat: Boys and girls wore petticoats under their other clothes. This is a lot like a skirt. Pocket: Pockets didnt get sewn into womens clothing, instead they were tied around the waist and the other layers of clothing that went over them had slits in them to make the pockets accessible. The pockets were not meant to be seen. Shoes: Children usually only had one pair. Shoes are made by 'cordwainers' or shoemakers. They had no right or left. 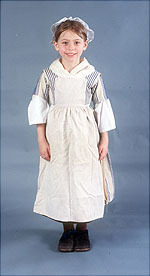 Dress: Bothe young boys (until age 5) and young girls wore these dresses. They laced up the back and had leading strings for guiding young children who were learning to wak or restraining "active" children. Neckerchief: This was mean to fill in the neckline of the gown. It also protected from the sun or from the cold. Apron: These were a plain white cloth that was usually pinned on with straight pins. 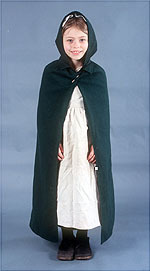 Cape: It was woolen and hooded. It was made large enough to go over all clothing, and was usually balck. It was worn by both girls and boys. 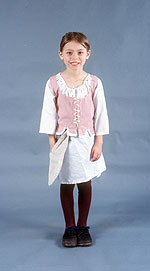 Most younger boys up to about age 5 wore the same clothing as most younger girls. 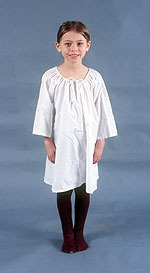 Even 'jumps' or 'stays' were worn by young boys to improve posture. 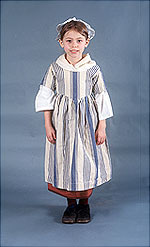 Younger boys even wore dresses until about age 5 or 6. Capes and petticoats were even worn by boys!